This is a really easy and versatile dish that can be served as is or with the addition of a protein such as wild salmon or scallops. It makes an incredible lunch with a little blue cheese crumbled over the top. It may look like a lot of steps but they are really, very simple and it doesn’t require a lot of time to complete. I have made the cauliflower puree with homemade cashew milk (make your milk but reduce the water to make a thicker milk). Place a few inches of water in a saucepan and insert a steaming basket. Add all the cauliflower, cover with a lid and allow to steam until very tender. You want to keep the cauliflower as dry as possible before blending. While the cauliflower is steaming heat the butter and cream in a small saucepan over low heat until hot and the butter has melted, but not boiling. Place the cauliflower into the bowl of a food processor and puree adding the hot milk while the motor is running, stopping to scrape down the bowl a few times until all the cream is used and the puree is smooth. Season with sea salt and pepper. Cut the green tops from the beets – reserve to steam. Trim the beets at both ends. Place the beets in a baking dish and place about 1/4 inch of water in the bottom of the pan. Cover with foil or a lid. Place in the oven to roast for 50 – 60 minutes. I like to check about half way through and add more water if necessary. Remove the beets from the oven when a knife inserted in the center slides in and out easily. Allow the beets to cool. Using a paper towel rub the skins from the beets. Place all the ingredients into a non-stick pan. Cook stirring frequently until the walnuts are fragrant and the maple syrup begins to caramelize. Remove from the pan and allow to cool slightly. Roughly chop the walnuts. 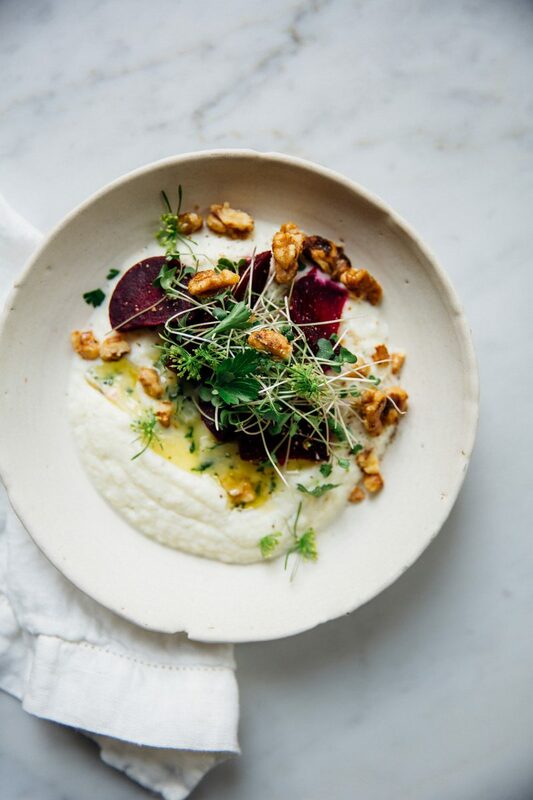 In a shallow bowl place desired amount of hot cauliflower puree, top with a little cultured butter, roasted beets, micro greens, parsley and maple walnuts. Serve hot with extra sea salt and pepper.